Basalt formations that are unique to the area around Othello are found in the Columbia Basin Wildlife Refuge and the Potholes region. The Potholes are a series of small lakes found in craters, which were formed during the Ice Age, surrounded by basalt formations. These small lakes are home to a variety of waterfowl. Basalt rocks are black volcanic rock, columnar in shape and varying in size. They appear like stark sentinels rising from the earth and give an elegant appearance to the surrounding dry land. 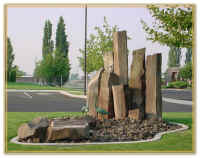 On March 23, 2000 Angel and Yolanda Garza, a local couple, donated basalt columns that were located on their property, to the City of Othello, to be used for display at the new city hall; its construction was completed in 1997. The City Council accepted the donation by resolution in April 2000, and an interior decorating committee was formed to determine the new city hall’s décor; one main focus of committee was to get the columns displayed. Working with the assistance of the community, the columns were mounted on the west side of city hall facing Main Street, in a bed of large lava rock lighted at night, they appear as a stark relief of shadows. Two verdigris copper sculptures of Sandhill Cranes are placed in front of the columns; these birds migrate to the area around Othello every spring and have become quite a tourist attraction. Other contributors who made this possible are John Pierre designer of the layout, Hollenbeck Excavation, Eagle Aerie #3396, Adams County Economic Development Council, City of Othello, Avista and Community Volunteers. This was truly a community effort and the result is a beautiful representation of the area in and around the Columbia Basin. The Pacific Northwest has undergone considerable geographical changes in recent geological history, starting about 50 million years after the dinosaurs became extinct. Fifteen million years ago, the Pacific Northwest was considerably different from now. Although the Cascade Mountains were formed and the Rocky Mountains were in place, the climate was wet and warm. Between the mountain ranges, there was a large tropical bay extending from the Pacific Ocean covering much of eastern Washington and Oregon. This inlet was an ocean body about two miles deep with the Othello area being at the deepest part. Most animals, now in the tropical parts of the world, lived in this region and it was relatively peaceful and quiet in geological terms until suddenly a large fissure in the earth’s crust opened up and a huge river of very hot liquid lava flowed from the eastern Oregon area filling the tropical bay with watery lava so fast that the water boiled away and the lava engulfed any vegetation that existed. These huge lava fissures flowed off and on for millions of years ranging from a few feet to a few hundred feet thick with levels of weathered rock, blowing dust, soil and plant life ranging from a few inches to a few feet thick in between the flows. This first series of great flows were called the Grand Ronde Basalt Flows and are about 9,000 feet thick. After a three to five million year quiet period, the fissures again began to flow watery lava across the basin. These later flows are called the Wanapum Basalt Flows and were centered around Vantage and lasted between two and five million years, but were a fraction of the volume from the original Grand Ronde. However the Wanapum Flow, and later the Saddle Mountain Flow, were important because they brought the ground level above the sea level, and in doing so pushed the Columbia River west against the Cascade Range, causing the river to go around what is now known as the Columbia Basin Basalt of the Big Bend area (Big Bend of the Columbia River). As the lava flows ended approximately two million years ago, a dry period began, which created dust storms unequaled in known history. These dust storms dumped top soil over the lava flows making, in some cases, 400 feet of top soil in the Palouse area (the area east of Othello is 100 ft. thick). At the same time, great pressures existed on the crust from the north to the south buckling the basalt creating the Frenchman Hills, Saddle Mountains, Yakima and Rattlesnake Hills running east to west through the basin area. After a million years of dust storms, the ice ages began about 200,000 years ago and ended about 10,000 years ago. Throughout this time, ice flows repeatedly came down to the Columbia River and then retreated, creating a series of torrential floods, the largest ones known on earth. These torrential floods washed out the topsoil and dug into the heavily fractured basalt rock throughout the eastern Washington area exposing the history of the area for the last 10 million years. It is possible that the last flood, 10,000 years ago, is what killed and buried the recently discovered “Kennewick man”. Since the last flood, the Columbia Basin has not changed much. Approximately 400 years ago, there was a massive 8.5 - 9.0 earthquake, which may have caused the Saddle Mountain landslides and possibly the 500 ft. vertical fault found south of Royal City in the hillside. Two hundred years ago Lewis and Clark first saw the basalt cliffs cut by the Snake and Columbia Rivers. One hundred years ago Othello was located on top of the world's largest lava flow and on the edge of what was once a flood lake blocked by the Saddle Mountains and forced to flow west through the Crab Creek Coulee and south through Scootney Springs Coulee leaving wind blown top soil east of Othello, mostly unscarred from the torrential flooding. West of Othello is Drumheller Channels National Natural Landmark consisting of 44,906 acres, and preserving physical evidence of this geological history.